0.65CaTiO3–0.35SmAlO3 ceramics (CTSA) were synthesized by the conventional solid-state method. To illustrate the effect of MgO/Eu2O3 additives and sintering temperatures on the dielectric properties of the CTSA ceramics, we performed qualitative and quantitative analyses. XRD analysis revealed that the perovskite phase was the main phase and a second phase Ca3Al2O6 appeared with steadily increasing Eu2O3 content in CTSA ceramics. The appropriate ratio of MgO/Eu2O3 additives resulted in a dense microstructure and excellent microwave dielectric properties, and lowered the sintering temperature from 1500 to 1315 °C. 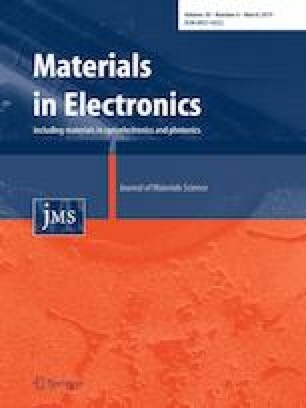 Excellent microwave dielectric properties of εr = 45.32, Q × f = 43,600 GHz (at 5.0 GHz), and τf= − 1.1 ppm/°C were attained for 0.65CaTiO3–0.35SmAlO3 ceramics with 0.5 wt% MgO and 0.2 wt% Eu2O3 additives sintered at 1315 °C for 4 h.
The authors are grateful to the support of Priority Academic Program Development of Jiangsu Higher Education Institution (PAPD), Jiangsu Collaborative Innovation Center for Advanced Inorganic Function Composites.